StyrocoatÃ¯Â¿Â½ Sprayable Plastic Coating. StyroCoatÃ¯Â¿Â½ Plastic is a sprayable polyurethane plastic formulated to economically coat a variety of surfaces. Dispensed through Smooth-On's EZ~SprayÃ¯Â¿Â½, Jr. cartridge system, the plastic cures in about 2 seconds and can be applied to vertical surfaces without running off. An advantage of the system is that large areas can be covered in a short period of time. Cured plastic is lightweight, impact resistant, and water resistant. It can be sanded for priming and painting. Plastic can also be sprayed into a rubber mold to make fast, impact resistant castings (application of a release agent may be necessary before spraying into the mold). 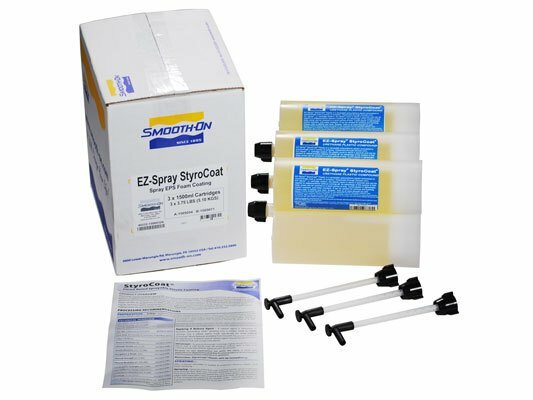 StyroCoatÃ¯Â¿Â½ Plastic is used for theme design / fabrication applications, making movie and theater set environments, making surfaces water resistant and other industrial applications. StyroCoatÃ¯Â¿Â½ plastic is FLAME RATED and meets the criteria for NFPA Class B Interior Wall and Ceiling Finish. Click here to download and view the certification. Yield - Each cartridge contains 3.75lbs. (1.7 kgs) of material. Assuming a thickness of 0.1in. 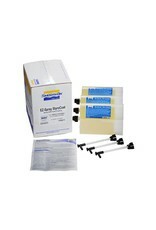 (0.25 cm), one cartridge of StyroCoatÃ¯Â¿Â½ Plastic will cover approximately 6.43 sq. ft. (0.6 square meters).